Getting plenty of protein in your diet is a must, but it may be more challenging if you eliminate meat, eggs, or dairy foods from your meal plan. Vegetables aren't often thought of as high-protein foods, but surprisingly many veggies are excellent sources of this essential nutrient. Believe it or not, sweet corn adds extra protein to your menu. One large ear of cooked yellow sweet corn provides you with about 4 grams of protein. To cook this delicious vegetable, place the corn in boiling water for 10 minutes, let it cool for 5 minutes, and serve. Alternatively, try canned corn in various recipes including soups, salads, side dishes, veggie burgers, and casseroles. A cup of cooked Brussels sprouts also provides about 4 grams of dietary protein. Brussels sprouts are also loaded with fiber, potassium, and folate. Try Brussels sprouts in casseroles, side dishes, appetizers, and soups for an extra boost of protein. Cooked asparagus contains just over 4 grams of protein in each one-cup portion and makes an excellent addition to any dinner menu. Cook asparagus by sauteing it, steaming it, or boiling it for about five to seven minutes. You can even try grilling asparagus. An easy, delicious way to prepare asparagus (and boost protein even more) is to saute it with olive oil, salt, and sesame seeds. Artichokes are fairly high in protein, containing about 5 grams in each large artichoke. The heart of the artichoke is where the majority of the protein comes from. Add artichokes to soups, salads, casseroles, and dips. Spinach is also a good source of plant-based protein, providing about 5 grams in each cooked one-cup portion. Spinach is an excellent source of fiber, iron, calcium, potassium, folate, vitamin K, and vitamin A and makes a nutritious addition to recipes like casseroles, soups, and salads. A cup of cooked broccoli florets provides almost 6 grams of dietary protein for vegetarian and vegan dieters. Broccoli is a versatile vegetable that's easy to incorporate into a variety of recipes like casseroles, salads, and side dishes. Or, simply boil or steam broccoli and eat it with your main course. Bean sprouts are an excellent source of protein, but the amount of protein varies based on the type of bean sprouts you choose. Some sprouts contain 8 grams of protein per cup. To cook bean sprouts, boil them in water for about two or three minutes and add to soups or salads. Or, lightly sauté sprouts in oil and add to a stir fry. Protein-rich peas are loaded with fiber, vitamins, and minerals and go great in vegetarian casseroles, soups, salads, stir frys, or side dishes. Green peas provide almost 9 grams of protein per cooked cup, and split peas contain just over 16 grams of protein in each one-cup portion. One cup of cooked chickpeas provides you with over 14 grams of dietary protein, and ¼-cup portion of hummus (made from chickpeas) contains about 5 grams. While peas do lack certain essential amino acids, pair them with whole grains or nuts and seeds to form a complete protein. 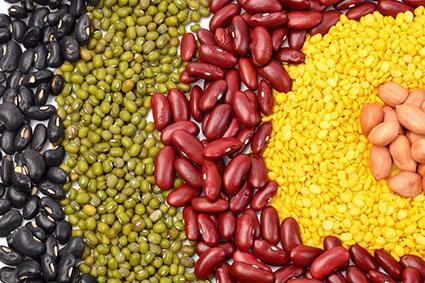 Dried beans, such as navy, baked, pinto, black, kidney, lima, and soybeans are excellent sources of protein for vegetarian and vegan dieters. Dried beans work well in soups, salads, casseroles, veggie burgers, bean burritos, side dishes, appetizers (like edamame), and bean dips. A one-cup portion of dried beans generally provides you with 12 to 22 grams of protein, with soybeans containing the highest amount. Tofu, made from soybeans, is also protein-rich. Lentils are one of the highest-protein vegetables to choose from, and work great in a variety of recipes. One cup of cooked lentils provides about 18 grams of dietary protein. Try lentil soup, make lentil veggie burgers, or add lentils to rice or other whole grains to form a complete protein. Vegetables highest in protein are part of the legume family. Because legumes provide many nutrients found in meat, they work well as meat substitutes in vegetarian and vegan meal plans. However, legumes aren't the only source of protein from vegetables. Eating a variety of nutritious veggies throughout the day helps contribute to your daily protein needs.